The Japan Aerospace Exploration Agency (JAXA) on Nov. 11 successfully retrieved a capsule that was jettisoned from a Japanese unmanned cargo spacecraft and landed in the Pacific Ocean. It marked the first time that Japan successfully collected specimens of scientific experiments from the International Space Station (ISS), JAXA said. According to JAXA, the capsule was released at an altitude of 300 kilometers at around 6:20 a.m. on Nov. 11 from the cargo spacecraft Kounotori 7, which had separated from the ISS on Nov. 8. After the release, the capsule entered the atmosphere about 100 km above the Japanese archipelago while maintaining its orientation. Then, it parachuted down, landing in the sea at around 7:05 a.m.
A ship that had been waiting for the splashdown collected the capsule in the sea off Minami-Torishima island of the Ogasawara group of islands at around 10:30 a.m. The circular cone-shaped capsule is 84 centimeter in diameter and 66 cm in height and weighs about 180 kilograms. The vacuum stainless container can maintain its interior at a temperature of four degrees for long periods even if its outer part is exposed to high temperatures of up to about 2,000 degrees during re-entry. It contains about one kilogram of specimens, including proteins crystallized in the ISS. A capsule ejected from a space cargo vessel returned to Earth on Sunday, bringing back experiment samples from the International Space Station (ISS) in the first such mission for Japan. 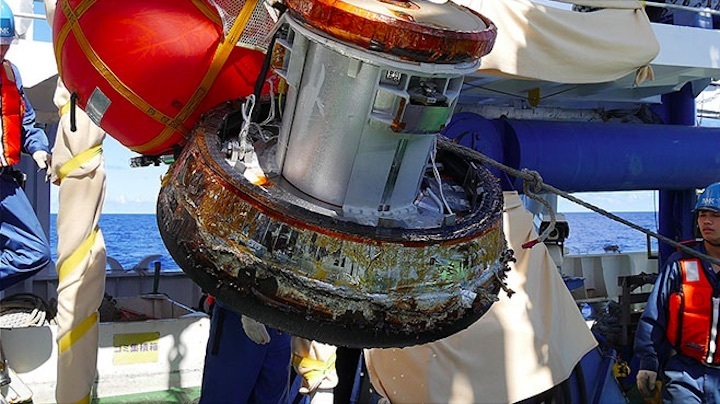 The Japanese Aerospace Exploration Agency (JAXA) said the capsule, measuring 84 wide and 66 cm high, made a parachute-assisted splashdown in the Pacific near the island of Minamitorishima early in the morning and was retrieved later in the day. JAXA is now aiming to develop a new capsule that can return home without being assisted by a space vessel, while the success of the latest mission is also expected to help in the development of Japan’s own spacecraft for manned missions in the future. The retrieved capsule contained protein crystals grown in experiments conducted aboard the ISS that JAXA says will be analyzed for medical purposes. High-quality protein crystals obtained without being influenced by gravity will be helpful in exploring the causes of some diseases and developing medicines to cure them, according to the agency. The samples will be transported on Tuesday to JAXA’s Tsukuba space center in Ibaraki Prefecture, where scientists will study them in the coming weeks. In September, the Japanese cargo vessel Kounotori 7 was launched on an H-2B rocket, delivering the capsule and other supplies to the ISS. The vessel departed from the space station Thursday and released the capsule Sunday morning before burning up with waste from the ISS when re-entering Earth’s atmosphere, JAXA said.